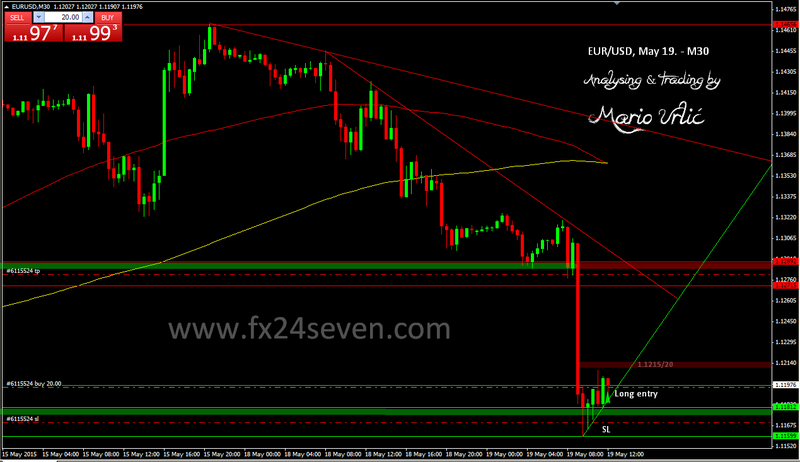 I will try to trade EUR/USD today. Based on my analsis from this morning, after this decline I decided to wait and enter long here at 1.1196. SL is placed at 1.1170 for now. Let’s try to take this possible fully return up. First resistance on the way up is 1.1215/50, the previous support from May 12./13., there is H4/MA100 here at 1.1200 as well, if we manage to get true that, there is a chance to reach my target at 1.1280, the previous support/resistance level. This is 1:5 RR setup and it could be a quick trade. I will not move my SL at BE for now. Like I wrote in my previous EUR/USD analysis, I don’t belive in talk, just action. Could we cover this ‘ECB’s Coeure talk’ now? Let’s see how will my trade ended today!? Ur thinking is right.I lk ur concept.every body follow ur advice.good luck my frnd.